Batchelors Way: Project #1 on our House! Project #1 on our House! We have been in our new house for about a year and a half. We have been busy finishing the basement and decorating the Batchelor way! Our first project was the mudd room. I designed it and handed the sketch to Les and he built it. He was pretty proud of himself, and rightly so. 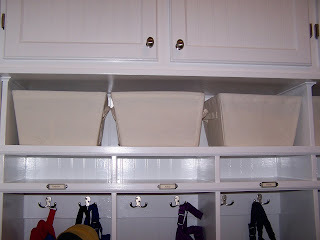 Every child has his own cubby for shoes and more. You know how I like to be organized. We even put every childs name on his cubby with metal name tags! Love it! Don't you with you had such a handy husband? can't wait to own a house an start built-ins projects like this one. This is awesome! 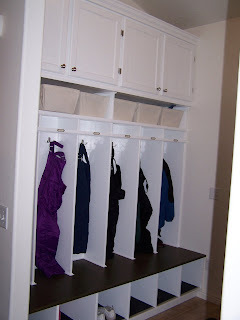 We're hoping to do something similar with our front closet.